Through somatic yoga therapy, we become more in touch with what tension represents in our body and work toward releasing it and finding greater freedom and ease in our awareness in ourselves and life choices. Each client has individual gifts and wisdom that come alive when we trust in a creative therapeutic process. My one-on-one work with people is deeply gratifying, purposeful, and aligned. Moving through both of us is a force that transcends the mind, will, and ego of two individuals. My clients have described me as a “soul cartographer,” a grounding and empathic presence who helps them understand the connection between their present moment experiences and emotions, and a therapist, coach, and healer with an open, calming, and trustworthy manner. I challenge and nudge clients toward their edge with lightness and grace and, when appropriate, it’s very natural for humor to enter the space. While our work is a collaborative process, it’s also about you and what’s yearning to be awakened within. My interest in “energy” started when I was a preteen. I was reading books about ancient yogic philosophy and Native American wisdom and wanted to learn all I could about the energy moving in and around the body. In a dualistic alternate universe, my upbringing drove me toward a very westernized sense of success that had me unaware of my own energy and in a great deal of struggle and pain: a focus on grades, achievement in athletics, strenuous professional training in the performing arts. Not all of this was in vain as it eventually brought a level of sophistication to my understanding of energy medicine. There were many years of misunderstanding how and where I fit in as I was ungrounded, in pain, and stressed all the time – unaware of myself, relationship to others, and the world around me. In my teens, I found yoga and was introduced to somatic therapy in my twenties. When I was suffering deeply, I recognized and found there were body-centered ways of being and healing that not only provided relief but also changed my life. I recognized this was what I wanted to bring to the world. I have led workshops on the healing effects of somatic integration throughout the United States and internationally since 2009. I combine my experience as a certified life coach and practitioner of somatic therapy with my embodied wisdom as a certified meditative yoga teacher and lifelong improvisational movement artist. With a focus on somatic psychology, I earned an M.A. in psychology at the California Institute of Integral Studies in San Francisco. I hold a B.F.A. 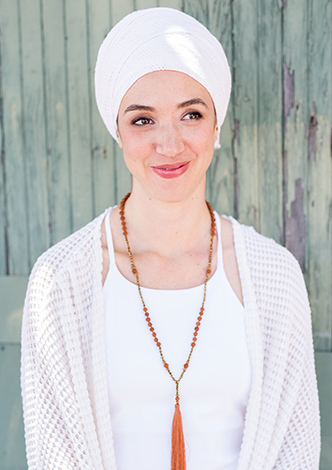 in dance teaching and performance, a 220-hour certificate from the International Kundalini Yoga Teachers Association, and a 200-hour certificate from YogaWorks, and have accrued 150 hours of Kundalini Yoga Therapy training. In 2013, I founded The Power Within Healing, offering to coach in vision-based living supported by yoga, embodiment, and meditation. I have led or co-taught several retreats at the Kripalu Center for Yoga & Health and most recently created both a brick and mortar and online yoga and wellness hub called Portal 18. I was born and raised in New Jersey, where all the best people are from ;).